She came to the Casa to ask for help, because her 4-year-old daughter is developing a mental problem. The daughter was suspended from kindergarten and the mother was asked to look for professional mental health care. Maria came to the Casa with much anguish, because she doesn’t have the means for such care and treatment. It was recommended that she go to the city of Mexicali (a 2-hour drive), so she can have a more clear diagnosis and treatment because of her age. 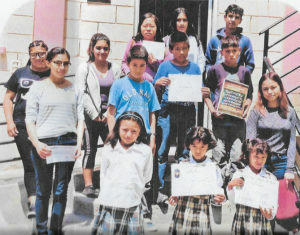 Casa de los Pobres provided the money for transportation expenses to Mexicali. The daughter will need to come back for future help as needed to find out about her diagnosis and treatment. As the mother has no stable job (collecting in the dumps), she lacks medical assistance. Mary Elizabeth was very, very grateful for the help she received from the Casa along with the food we provided for the little family. BLANKETS, TARPS, and STAPLE FOOD ITEMS are needed now. Oatmeal, beans, rice, sugar, flour, peanut butter, tuna, powdered milk, backyard fruit are all welcomed. Children’s vitamins, baby Tylenol, diapers, soap are needed. The struggle of these people for the basic necessities of life is unrelenting. There is no welfare system in Tijuana! 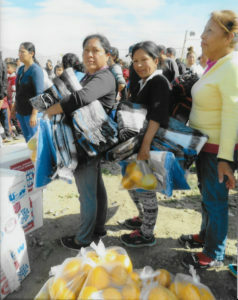 The people living in the colonias outside the city are especially distressed due to recent rains and very cold temperatures. The wind chill factor makes it even colder in Tijuana and the surrounding hills/colonias, making it more difficult to keep warm at night. The Casa is swamped with requests for extra FOOD, BLANKETS, and TARPS. Food, blankets, household items, linens and toys all require permits to cross the border in the truck. Used clothing is transported in private cars, so it must be in excellent condition. While the Sisters work is difficult and tedious, they are models of patience and mirror God’s love in all they do. The part-time Pediatrician in the Casa’s Clinic is seeing significant improvement in preventative care. The people pray each day to thank God for the assistance your donations provide. In February,, 53 families contributed $18,865. We also received a generous donation of $2,000 from the La Jolla Kiwanis International Fund. Thank you Kiwanians! The men, women, and children of the Casa say THANK YOU for everything! Thank you also to those who gave blankets, jackets, sweaters, sweats, bedding, and FOOD. We have NO overhead, except minimal PayPal and credit card charges. Everything contributed goes directly to help the people. The truck comes to 6432 Cardeno Drive, La Jolla 92037 every Tuesday to pick up your donations. This entry was posted in February 2018 by Pat Erzinger. Bookmark the permalink.